After the sun-filled Thursday, Friday was back to what Paula had assumed the weather might be for the week, with rain falling and rather gloomy as a result. 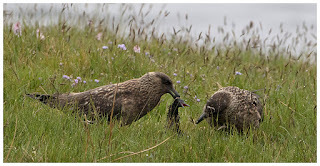 We eventually headed out to look around the isle, in case anything interesting showed itself, but I think the wildlife had also decided to shelter from the rain and we ended up in a pub of all places, with Kate requesting a cup of tea! It was a day for getting things ready for the flights back home alas, though I found myself trying to drink in the view from the windows of the cottage as much as I could, knowing I'd miss it terribly. And so came the last day. Kate and I were to catch a flight off Shetland late afternoon, but as we'd done most of the packing already, we had time to enjoy the morning. 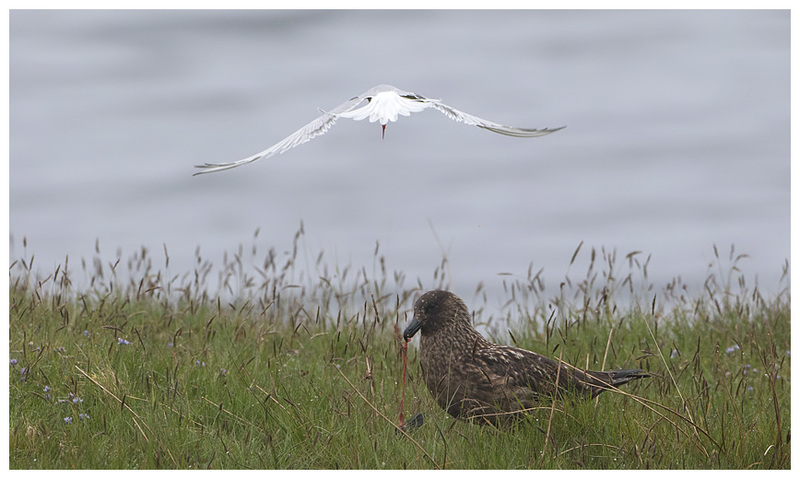 There were a lot of gulls around the headland in front of the cottage, so Andy took a stroll down to the water's edge and worked out where the local otter was vanishing to, each time we caught a glimpse of it. There seemed to be a small holt just above the rocks beside the water, with tracks leading to it. 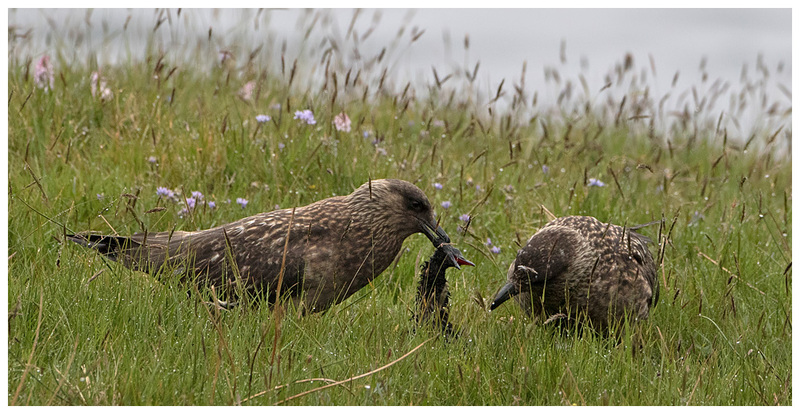 And, nearby was a discarded dead black guillemot; perhaps not to the otter's taste after all. 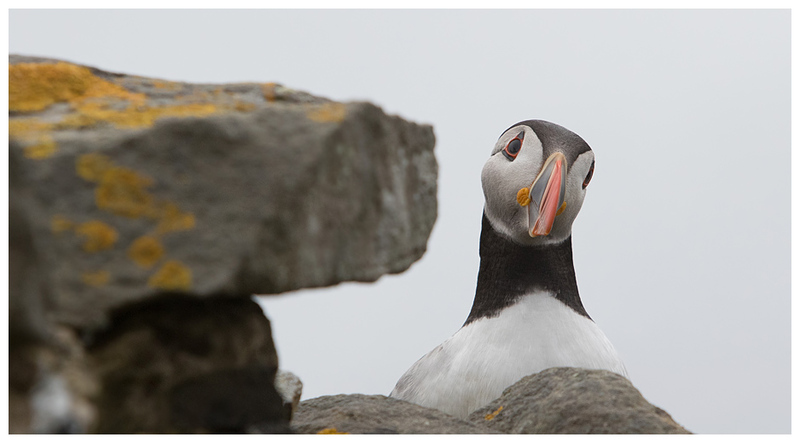 To provide us all with some entertainment, Andy relocated the guillemot to the grassy area above, stood back and we watched. Didn't take long for the local bonxies to notice it, and after circling for a few moments, they descended and began to peck at it. 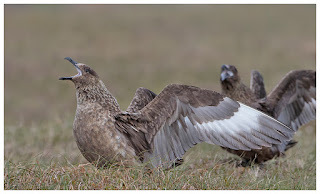 I had expected them to be rather ferocious, tearing up the carrion, but they were rather hesitant, taking it in turns to pluck bits away, keeping a watchful eye on anything approaching them. One of the bonxies then flew off, leaving its partner to feast alone. 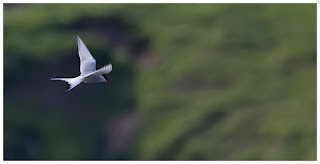 Though that didn't last long as an Arctic tern took offence to it, and started to repeatedly divebomb it. Whilst this action was going on, and I was trying to photo it from the Games room of the cottage, the others were busy chatting to a young birder called Logan (Johnson) who had kindly come over to tell us about what species he'd seen on Shetland, and I think also to meet with a certain WildlifeKate too. 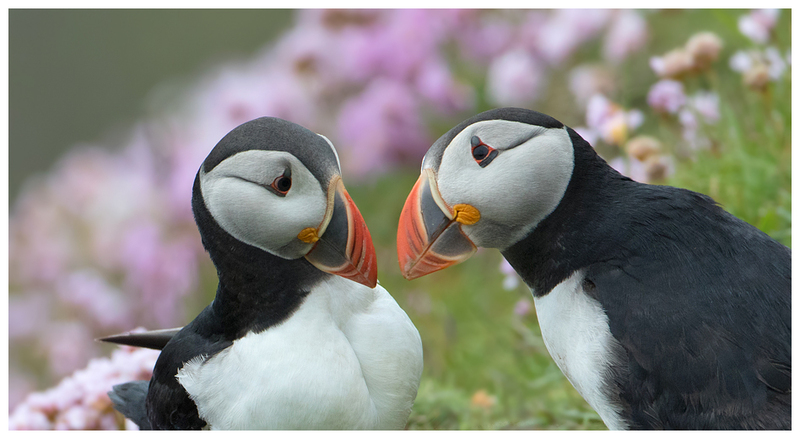 He's seen so many different species on the Isles, and has many photos of them too. 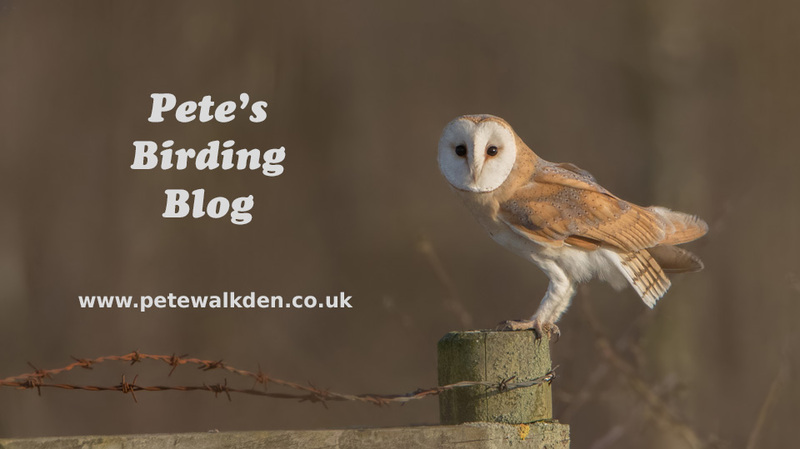 His Blog is well worth checking out. It might have been wiser to have met him earlier in the break in case he had any additional recommended sites we should visit. But as it was, it was our last day and Magnus also arrived to wave us off. Or did he? By now the mists had properly rolled in and Magnus quipped as we said farewell to the cottage and the others, that he'd see us later. Hmm. The airport was chaotic when we arrived, with a long queue to the check-in desks, and some flights on the screens already cancelled. Fog here causes major disruption. There was no information on our flight either, with just a white-board behind the desks with some additional notes scribbled hastily on to it. With only about an hour to make our connection in Aberdeen, it was starting to look like Magnus (and Logan has said similar) was going to be on the money! Hugh and The Urban Birder were also in the airport, with the former doing his utmost to ensure members of his tour were aware of things and were being looked after. One flight managed to land during a clear spell, but the mists soon returned, and by the time we were due to be boarding, there was still no information other than "on hold" (whatever that means!) for our flight. Shortly after, I was rather comically running into the arms of Andy on the top of Sumburgh Head, which is where he, Lyndsey and Logan had headed for the day. 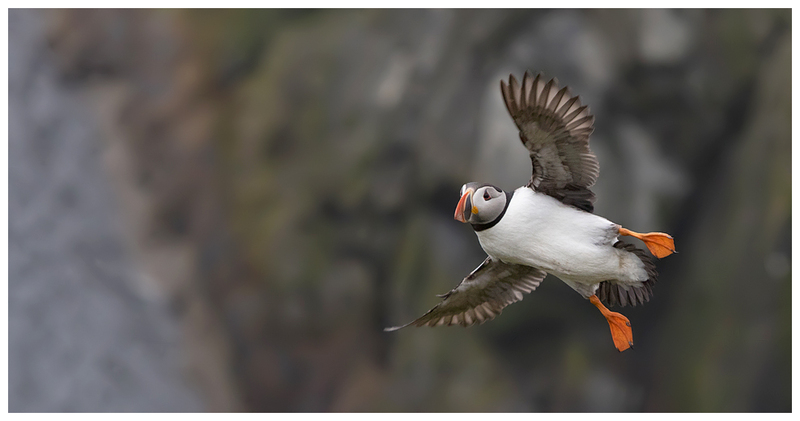 Kate was happy to head off with Paula who already had plans for the remainder of the day, leaving me to photo the puffins with the others. The mist around the headland made for interesting conditions to photograph the birds. 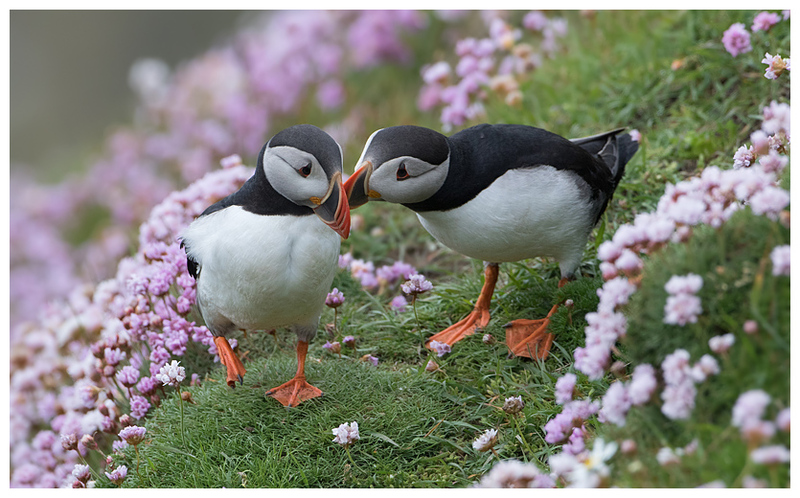 Initially I used the only lens I had with me, the 500mm to get some more intimate images of the puffins as they greeted each other. Such quirky little birds, they make great subjects to photo whatever they are doing, especially when performing their beak-tapping rituals. 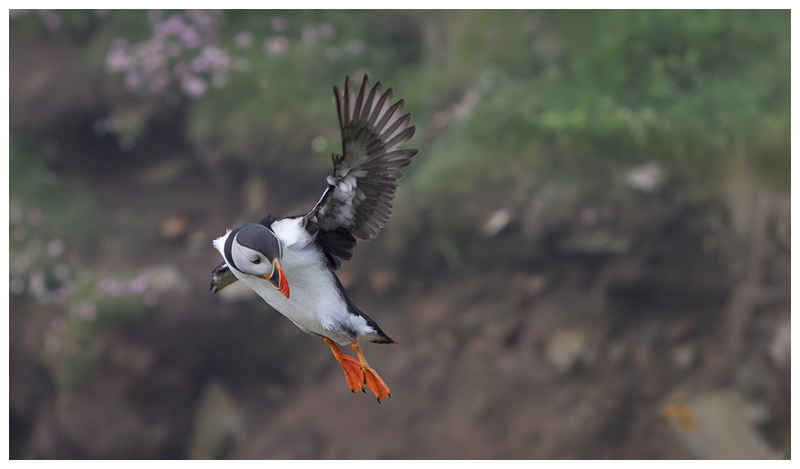 Unlike other days we'd been, the puffins were constantly taking off, vanishing into the mist and then fluttering back in soon after, landing back on the cliffs next to us. 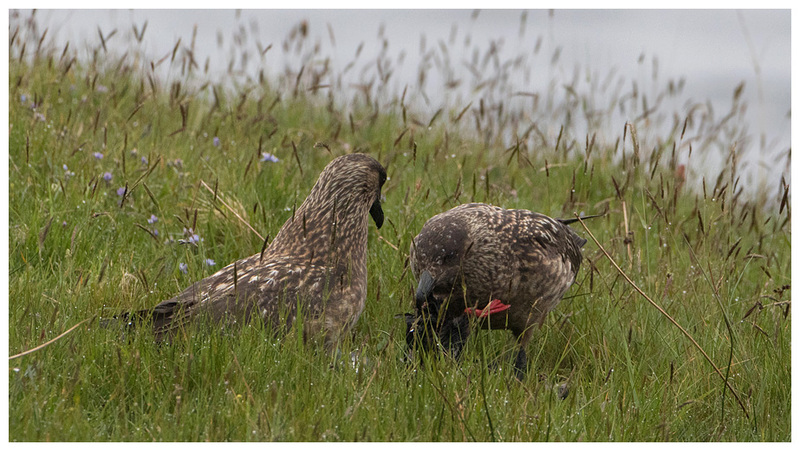 However, with the fog, it made it very difficult to pick them up as they approached, and even harder to focus on. 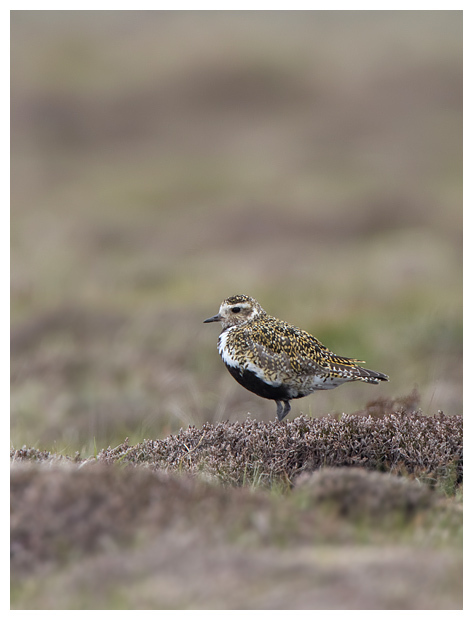 Initially, I tried a few with the 500mm lens, but it's simply too heavy to hand-hold for any length of time, and in order to get them in shot, it was a case of trying to focus as they just appeared from the mists. Fortunately, Andy and Lyndsey had a 70-200mm lens not being used, so I tried that instead. And, at about 200mm, it gave me enough time and room in the viewfinder to start to get some shots. 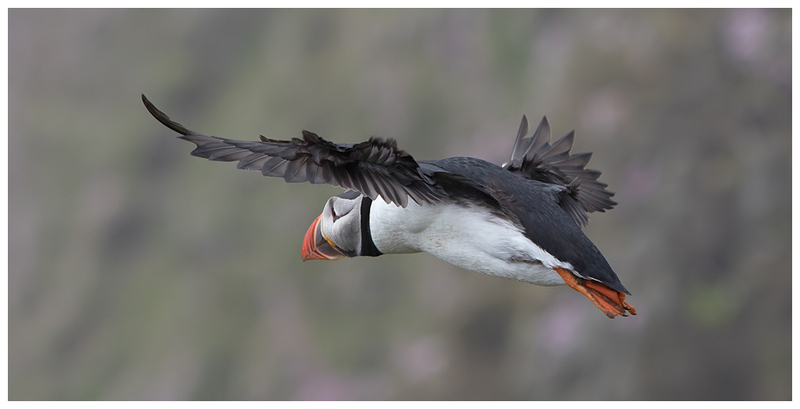 Then it was a case of tracking the puffins in, and hoping to get shots as they zipped past, or landed. Great fun. And using my usual aperture of f6.3 for others. 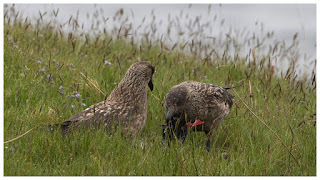 Then it was back to the in-flight shots again, until it was time for Logan to depart, and us, after a brief detour to see a sea cabbage (!! ), to return to the cottage again. I wasn't too unhappy about it, to be honest. I adore Shetland, so another unexpected night on it, and more time to soak up the atmosphere and the views, was most welcome. I awoke early in the morning, and peered out the window. Thick fog. Worse than the day before. Shutting out the light with the curtains, I went back to sleep. When it was time to get up, it was raining, but most of the fog had gone. We considered going to Sumburgh Head again, but after saying our goodbyes to all for the second time, we abandoned such plans due to the weather, and returned to the hotel at Sumburgh for another of those steak baguettes. Took a while to come, but it was a Sunday, in foul weather and we weren't in a rush. Final farewells to Paula and Hugh (and his family) at the airport, and we were soon flying home, via Edinburgh instead. As I sit here now typing this in, I can close my eyes (and make many typos) and see the fabulous view we had from Cheyne House, remember the sounds of the birds all around and then smile as I recall the banter we enjoyed with the others, in particular with Paula who, like last time, was an absolute angel the whole trip. Thursday was forecast to be sunny and almost warm, which given the temperatures during the trip so far would be a pleasant change. While it hadn't been cold as such, for me, after my week in Menorca days before flying up to Shetland, it was quite a change to the system! None of us had any plans for the day, so Paula said she'd drive us to some of the prettier areas of the isle to make the most of the sunshine. After a quick detour to see if any long-tailed skuas were around (they weren't), we headed to St Ninian's Bay. Before we even reached the parking area, we'd persuaded Paula to park up so we could jump out to grab the view from above natural tombolo, which is a sand causeway, with sea on either side. In the bright sunshine, the beach and surrounding sea looked gorgeous and had it been located down south, no doubt would have been littered with families of sun-worshippers. Thankfully up here, it was almost deserted and begged to be photographed. I had spotted some divers on the water, so hoofed off across the strip of sand for a closer look. 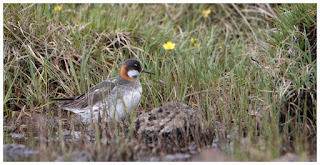 More red-throated individuals, and slightly annoyingly on the side of the bay that was backlit. But it was sunny and warm, and I was stood, slightly overdressed, in the most glorious and tranquil scenery one could ever hope to see. With barely a breath of wind, the water was calm, with small waves rolling on the one shore, and merely lapping on the other side. Heavenly. I had expected Kate to have followed me, but she'd vanished from sight. I wondered if she'd found something interesting to photograph, so headed back to where we'd first scrambled down to the beach. She had. 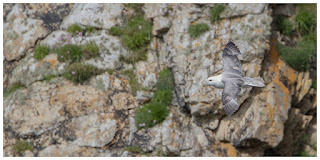 The cliffs were inhabited by fulmars, and they weren't in the least bit bothered by us being so close. Though Kate was more interested in a ringed plover scurrying around on the shore, amongst the rather foul smelling seaweed, attracting numerous flying insects for the plover to catch. 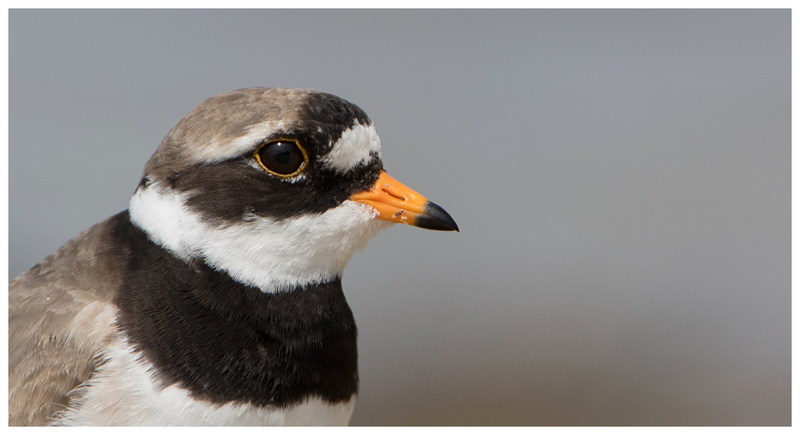 Lying on the sand, I started to get some low-level shots myself, until the plover walked right past me, well within the limit of my lens. I had to simply smile and watch it potter past me. Also nearby, very well hidden on the rocks near the shore, were several families of eider ducks, with about a dozen ducklings in tow. The female eiders blended in so well with the rocks, they were almost invisible when they stopped moving. They seemed to be spending their time either soaking up the sunshine or taking to the water, for a quick paddle around, before drying off again. Somewhat human-like traits, when beside the seaside on a sunny day! 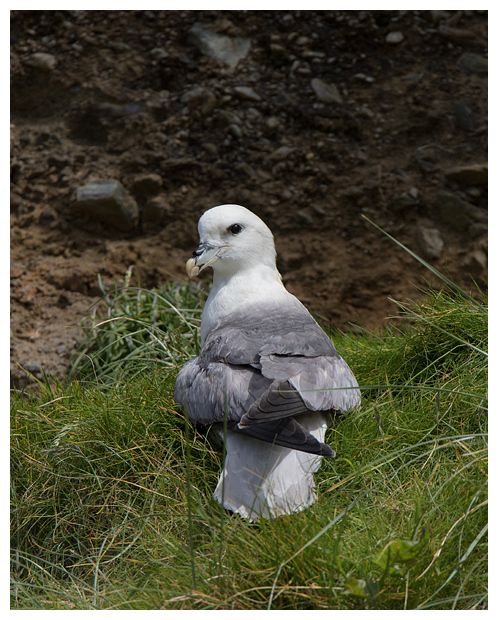 The fulmars divided their time between being sat on the nest, flying up and down the headland slopes, or flying out on to the bay, to bob about on the water. It was fun trying to photo them as they flew along the hillsides though. Arctic terns danced along the shoreline, targeting any fish along the way, dropping down like darts into the water to take them. Such a fabulous spot, it was difficult to drag ourselves away from it, but Paula was keen for us to head to higher ground, to get even better views. Well worth it too! Driving onwards, Paula pulled over above a small bay, as she said there may be common seals below. Not in the numbers she had thought, but there were about twenty either chilling out on the beach, or playing in the sea. Given our lofty viewing position and the clarity of the water, we could see them gliding along underwater, surfacing and also coming ashore, rolling around together as they did. We were slowly heading south, with the intention of revisiting Sumburgh Head. 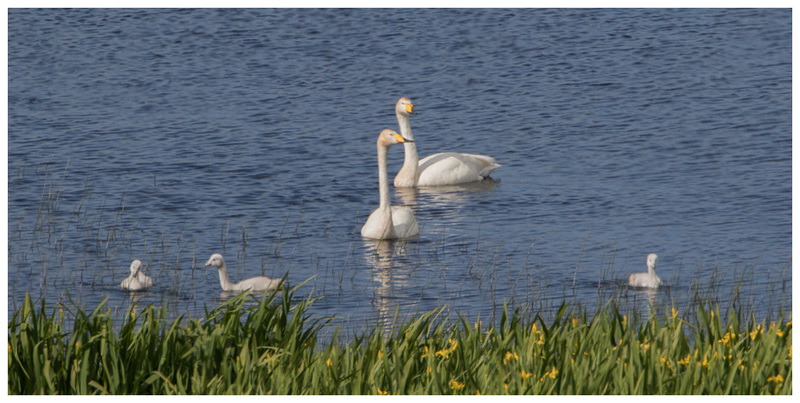 Along the way though, we stopped to admire a family of whooper swans drifting serenely across a loch. 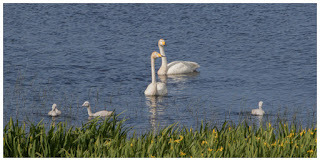 I'd never seen whooper swan cygnets before. And after bumping into Hugh's tour group again, and some more amusing banter, we made a beeline to Sumburgh, where we found Andy and Lyndsey already there, enjoying the antics of the puffins on the slopes. 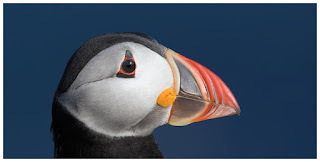 Puffins are such expressionate birds and are thus, very photogenic. The bright sunlight made it difficult to get a good balance between the white and black feathers on them, to retain detail on each. 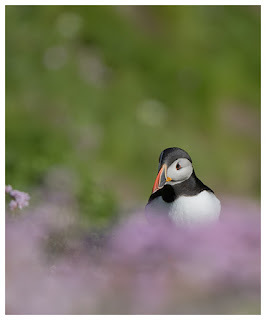 With the 500mm lens, I was able to concentrate on portraits of the puffins, as well as capturing individuals or pairs sat amongst the sea pinks (thrift) on the slopes. 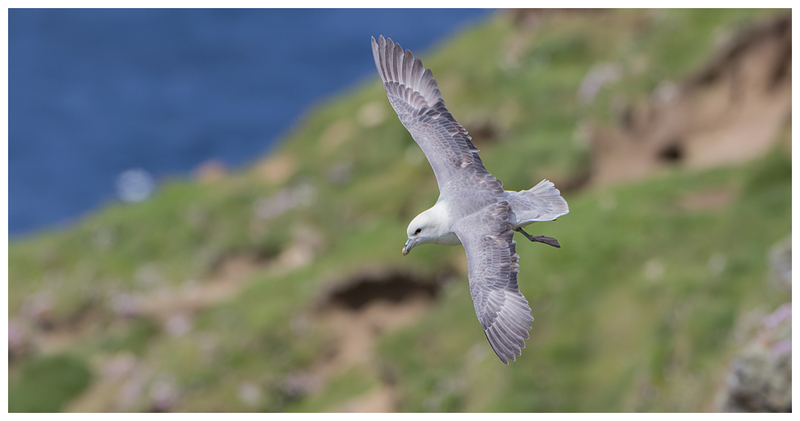 As the path follows the cliff edge, it is pretty easy to move to get different backdrops to the birds, such as the bright sandy slopes, or the lush blue sea beyond. By angling the lens so it was in line with the steep slope, I was also able to get the sea pinks in the foreground, though it did involve a lot of waiting for the puffins to be looking the right way for the shot I wanted. Whilst waiting, I had noticed that the one side of the cliffs was being used as a highway for the fulmars, gulls and occasional kittiwake to zoom up from the sea, to the taller cliffs by the lighthouse. And they were only a couple of yards away as they soared by. This meant I could get a focus lock on as they approached and retain it until they were really close. Something Kate soon spotted too, and joined in. 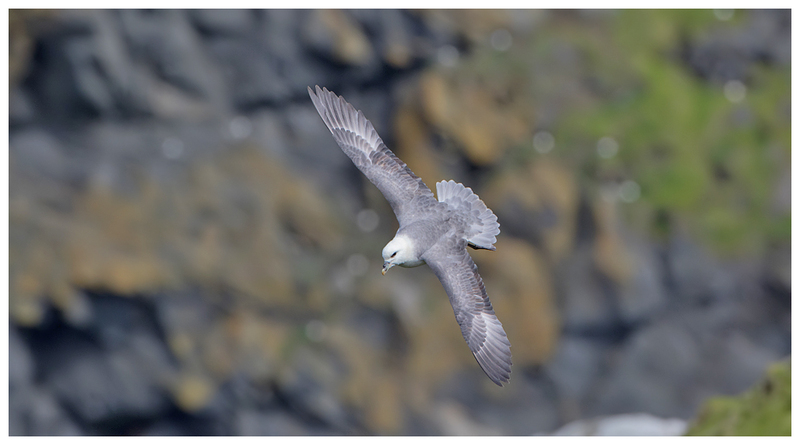 The fulmars were definitely looking at us as they drifted past. Then it was back home for a fine meal prepared by Andy and Lyndsey, with Magnus and Paula over too. 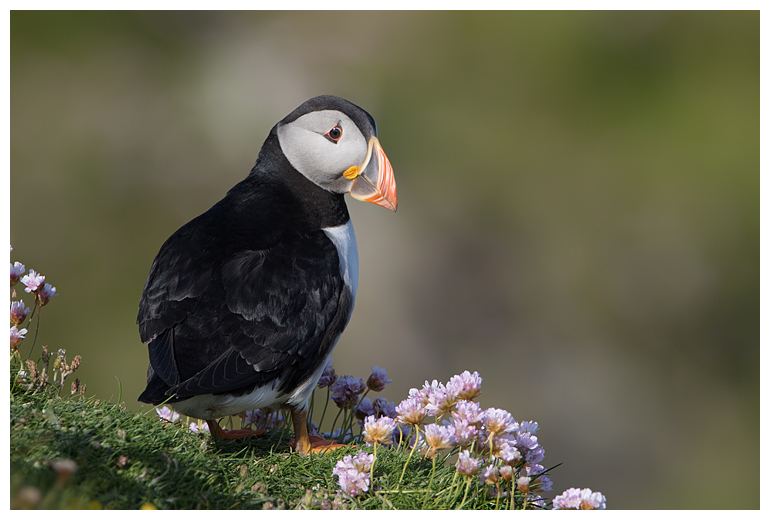 Another glorious day on Shetland, with more fantastic images and memories to treasure. 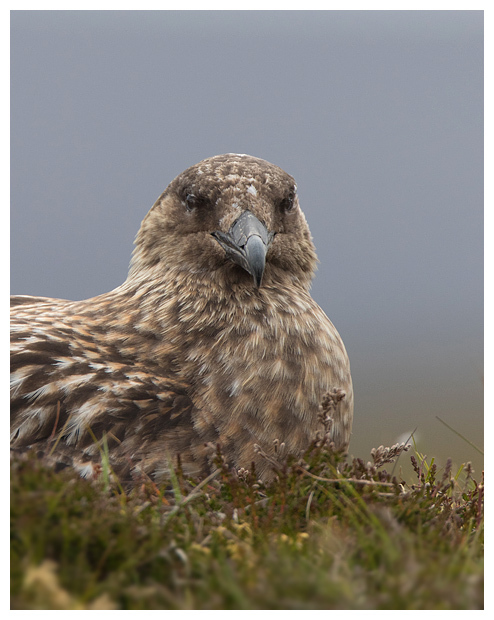 There are I am sure, many wonderful areas of Shetland that we didn't reach on the last trip, but one of the more obvious targets for wildlife was Hermaness. It involves a pretty long walk to reach the cliffs, and as that would have ruled Ian out from getting there, we chose to avoid it. But not this time. It was quite a long drive from our base on the Mainland, but with fair weather along the way, it was even enjoyable just being sat waiting for the ferries, as the gannets would be diving close to the shore, and if successful, they had to avoid the attention of the bonxies waiting in the wings. 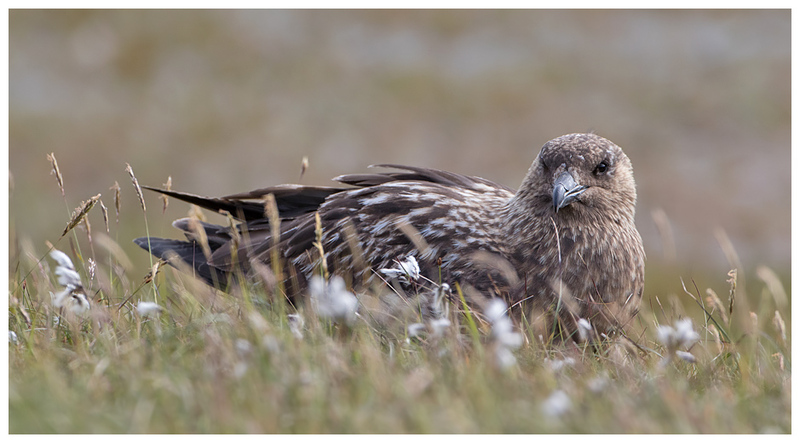 The reserve is on the northern end of Unst, and after driving right over the island, it's a case of parking up and then making the walk across the moors to the cliffs where the majority of the action is. 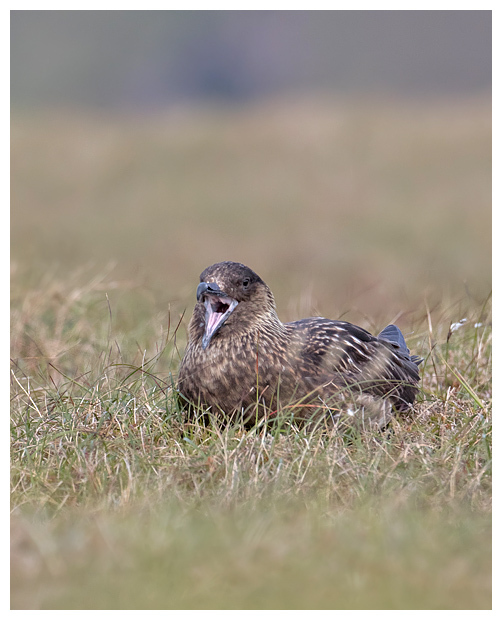 Thankfully there are now boardwalks leading the way over the rather boggy ground and along the way, the route bisects a colony of nesting bonxies, which provides a great excuse for stopping for a rest! The boardwalk eventually peters out and it's a relatively gentle slope up to the cliff tops; the view alone is worth stopping and breathing in for a short while. I can imagine that on a wild day it would be pretty terrifying up there, but it was breezy and sunny when we arrived, with blue skies and richer navy seas below. Gorgeous. 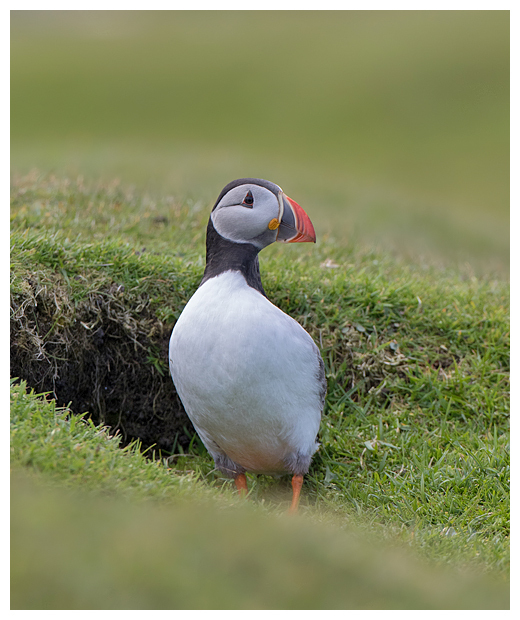 And greeting us as we arrived was a puffin, who had popped up out of a burrow to welcome the new visitors. Having been before, Andy advised which way to head for the various bird colonies, which is where we broke up into groups. 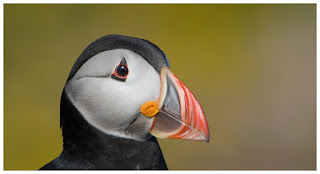 Having had my annual fill of gannets at Troup Head earlier in the year, I wanted to look at bonxies, fulmars and maybe more puffins. The fulmars were everywhere, and surprised me several times by appearing right in front of me, floating on air-currents, rising up the steep cliffs. Finding a sheltered spot out of the wind was an issue though, and in some places it was difficult to keep steady, even when kneeling down and using the tripod for support! As such, trying to track the puffins as they hurtled in from fishing, usually low down then up at the last moment, was near impossible. I tried using my 100-400mm for a while, but it just didn't seem able to consistently lock on to the birds against the changing background, and I chose to head elsewhere for slightly easier targets. Besides, my eyes were already stinging from the wind. With all the flowers decorating the slopes, Kate and I had hoped to get some shots of the birds amongst the vibrant colours, but getting a good view to the birds was also tricky. We could see them from afar, but by the time we were close enough for a shot, the angle of the shot would be either awkward or the cliffs themselves made the shot too dangerous to reach for. By the time I had ambled along to where the Muckle Flugga lighthouse comes into view, the others were heading back. Kate had already decided to meet Paula again where the gannets were skimming the cliff tops, and both Andy and Lyndsey had struggled to find the numbers of puffins they'd seen on their previous trip, and were going to try further back along the cliffs where we'd first arrived. I wanted to look over the end of the cliffs before also returning, so trudged onwards. 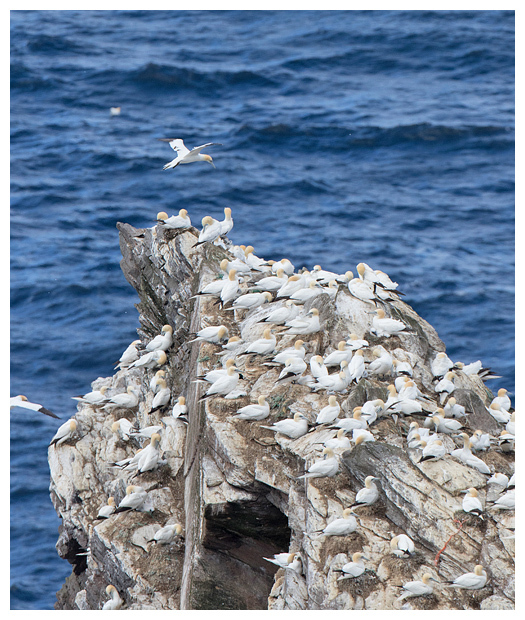 The views of the massive gannet colonies on the rocks jutting from the sea here were fabulous, so I sat down for a while, to eat lunch and simply enjoy the spectacle. 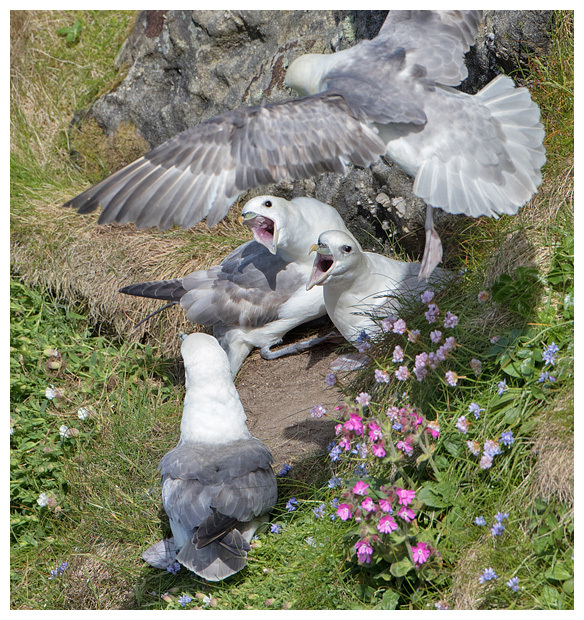 Some of the fulmars amused me too, when they reacted with real venom to any strangers arriving at their nest sites. It was time to make the walk back, and with it being such a remote reserve, there was hardly a soul around, at least at this far end of it. I had noticed though, about 200 yards ahead of me, a couple had struggled to cross one of the many boggy channels leading down the slopes and by the time I reached it, I could see that the mud was deep and I'd not be able to skip over whilst carrying so much gear. So I tried higher up the hill. There was plenty of boggy areas all around, with the bright green sphagnum moss covering it over, but jutting out into one area was a strip of grass. Safe to cross here, I thought. With hindsight I should have prodded it with a tripod leg, but I didn't, and stepped on to it. The grass immediately gave way and my foot, and then leg sank into the bog, stopping halfway up my thigh. Desperate not to drop my camera in, as it was balanced on my shoulder, I had to lean back and that put my other leg in too. Great. It was vile, wet and cold. And there was no-one nearby either. Carefully choosing a soft area to drop my camera and chuck my rucksack on to, I then tried to pull out my right leg. It was stuck. I could move my left, but it felt like I'd lose my boot if I tried any harder. What an utter pillock, I thought. No service on my phone of course, I realised I'd have to get out without any help. Not that the others would have helped, having admitted later that they'd have taken a photo of my predicament instead! By twisting myself over, I was able to start to pull my leg out, and by grabbing tufts of grass, I eventually unplugged myself from it, and crawled free, standing to assess the mess I had made. Both boots were full of bog-water and my trousers were covered in mud. Stylish. This of course made the walk back delightful, having to stop every 15 mins or so to remove my boots and wring out my socks. But the strong wind blowing was now a benefit, as it helped dry out my trousers! After rejoining the others, and they'd stopped laughing, we strolled (and squelched) back to the boardwalk to photo the bonxies for a while. Most of them seemed to be sat on eggs, but we were fairly sure some had started to hatch, judging by the sounds from the nest sites, and the actions of the parent birds. For such fearful birds, the bonxies were so gentle and tender with each other and with what was going on amongst the cotton grasses at their feet. They were also keen to keep clean, and made good use of the many small pools around the area to wash in. 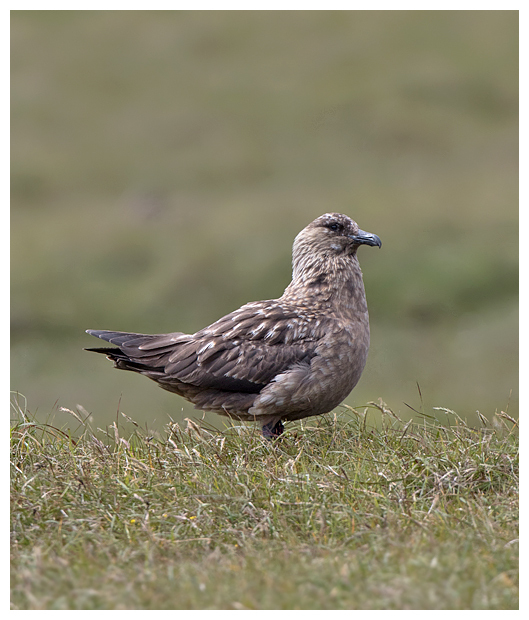 Unfortunately, while the boardwalk helps people safely reach the cliffs, it doesn't allow for alternative routes, so while we were all lying flat on it trying to photograph one bonxie as it washed, another visitor inadvertantly spooked it as he walked up the path. Such is life! 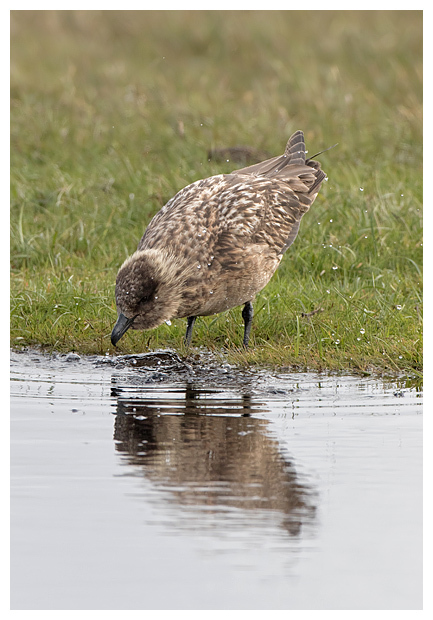 We turned our attentions to another pair nearby, and enjoyed watching them preen, stretch and yawn, as well as reacting to other skuas passing a bit too closely overhead. It was getting late though, and with two ferries to catch back to get home, where Magnus was preparing one of his legendary lamb roasts, we needed to get going. 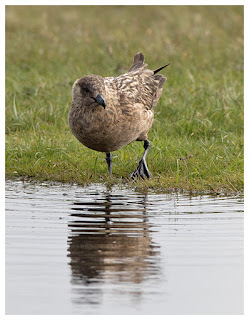 It was difficult to drag myself away from watching these awesome birds, let alone persuade Andy too, but I was starting to feel slightly chilly after my mud-bath earlier, and needed to be sat down for a bit. Hermaness is definitely somewhere I would like to return to again, and Unst in general too. Yet more reasons to return to Shetland... and the meal from Magnus? It was absolutely scrumptious! 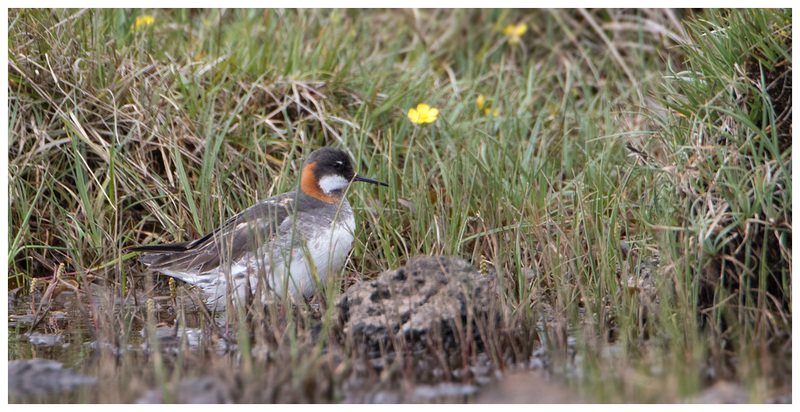 So to Fetlar once more, and another attempt to get that monkey off my back; the red-necked phalarope. 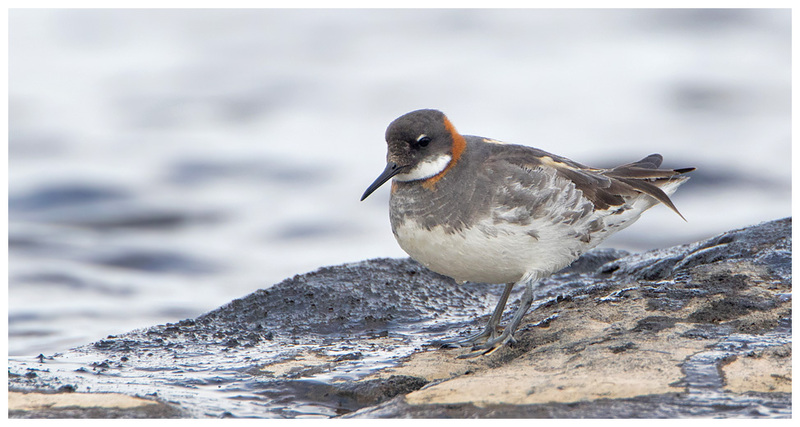 Last time I was in Shetland, not only did I manage to fail to connect with any red-necked phalaropes, but in the pursuit of them, also failed by literally minutes to see a pod of killer whales, that Ian and Kate enjoyed watching for several hours. An early start to head out across the islands to reach Fetlar, driving through some pretty miserable weather along the way, though the ferry crossings were made in bright sunshine, giving us all hope for the day. 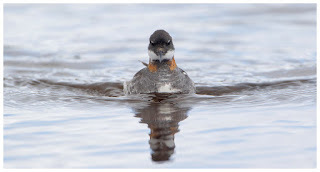 Well aware of my desire to see the 'ropes, Paula drove straight over towards Loch Funzie where we bumped into Hugh Harrop's tour and the Urban Birder, David Lindo. 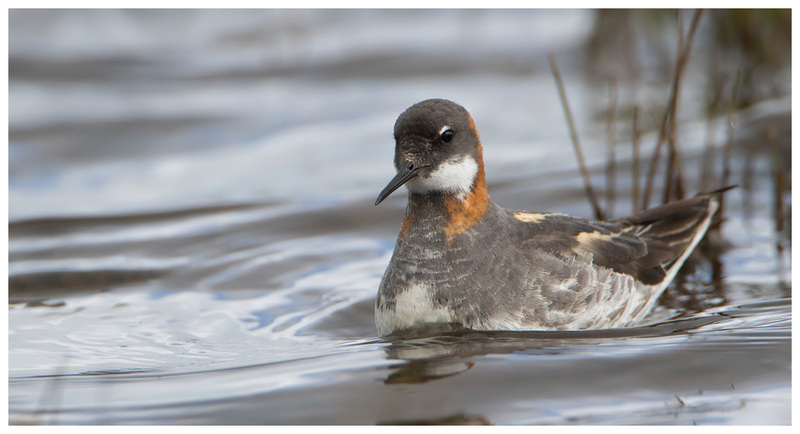 Whilst chatting to them, I heard the news I had wanted to hear, phalaropes were around and we'd just missed them on the loch. Or had we? Because eagle-eyed Lyndsey had spotted them on a small pool near the main loch, and without delay I found myself almost sprinting (a fast walk is my idea of that these days) towards the area, and suddenly I could see one, pottering around in amongst the long grasses of the pool, picking off insects. It got better, there was another at the back of the pool too. Wonderful! The four of us then chose sides of the pool to head to, with Andy and I trying to work out where the sun might appear if the blanket of clouds split open, and also whether we could get the birds against darker backdrops. Finally, to get low-level shots, we needed to be almost at water-level, which meant lying down in the mud and wet grass. 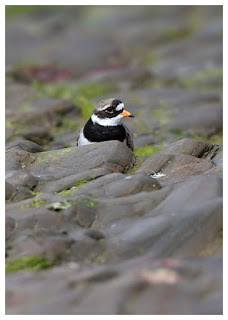 A small hardship to endure to get the images of these quirky little birds. Much like divers, I have seen plenty of them, but when they drop into the Midlands, they're rarely in summer plumage and on the odd occasion that happens, the birds are usually a country mile from the viewing position, with crowds of fans wanting a sighting, hence never allowing any opportunity for a closer view. But here, on Fetlar, I had two of them, on a pool smaller than my back garden. The birds, both females, were happily wandering around the edges of the water, finding plenty of insects to eat, both from rocks and vegetation, and also from the surface of the water itself. And much like those I have encountered closer to home, they weren't in the slightest bit bothered by us being near them; in fact, they walked so close at times, I felt like I could have reached out to stroke them. I didn't, as I thought that might be pushing my luck a bit too far. In fact the only thing that seemed to unsettle them were the nervous dunlins also feeding on the same pool, which seemed to take flight every time a skua passed overhead. 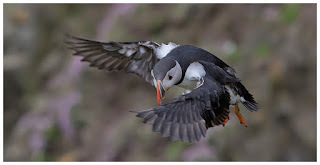 Apart from the 'ropes coming too close at times to focus on, the other difficulty when shooting from ground-level is getting a clear line to the bird, and I frequently struggled to get a focus lock on, with grass or small rocks getting in the way. 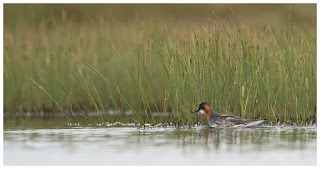 Thankfully the birds remained on the pool and while they came and went in terms of being on the right side of the pool, they gave great opportunities to photo them in vegetation, against light and dark backdrops, swimming and also perched on rocks, out of the water. 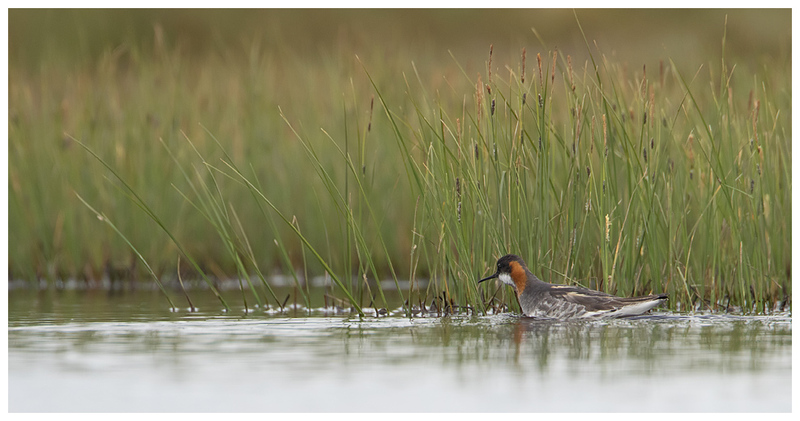 I could have spent the entire day lying there photographing the phalaropes, but one low-flying pass from a skua caused panic on the water and they, along with the dunlin and well hidden snipe, relocated elsewhere. Time to look at what else was on offer on Fetlar, now I had ticked one more item from my wildlife bucket list. Red-throated divers were again nesting on the main loch, though this time towards the back, so I could lie down beside the road at the lochside, and try for shots of them. At times there were four adults on the loch, though never really very close. 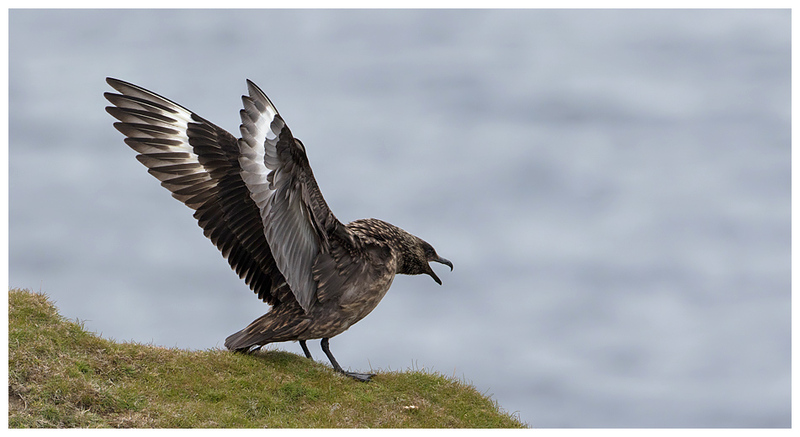 One drifted reasonably near when preening, and I was ready to grab some shots as it stretched its wings. Hugh's group passed us again, and he mentioned that the airstrip area was well worth a look, so that's where we tried next. 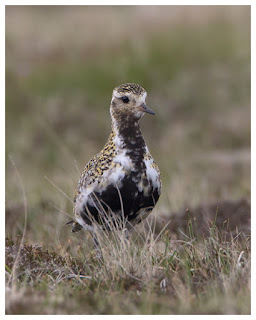 He was right, and within minutes of getting on to the track leading up the hill, we had seen golden and ringed plover, whimbrel and Arctic skuas. Excellent! 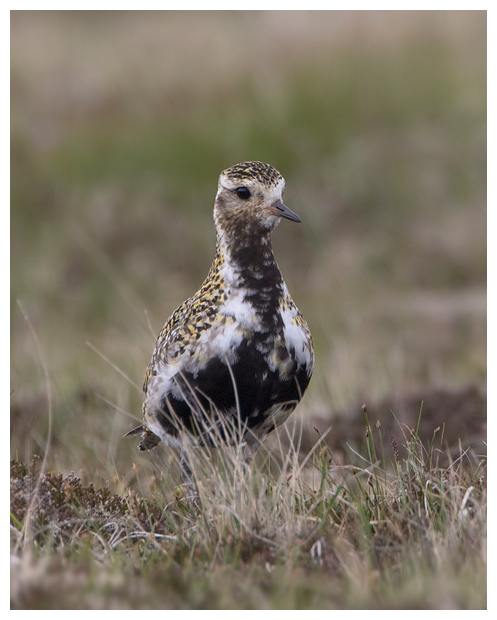 Staying in the car, we were treated to close views of the golden plovers as they scampered over to see what we were. 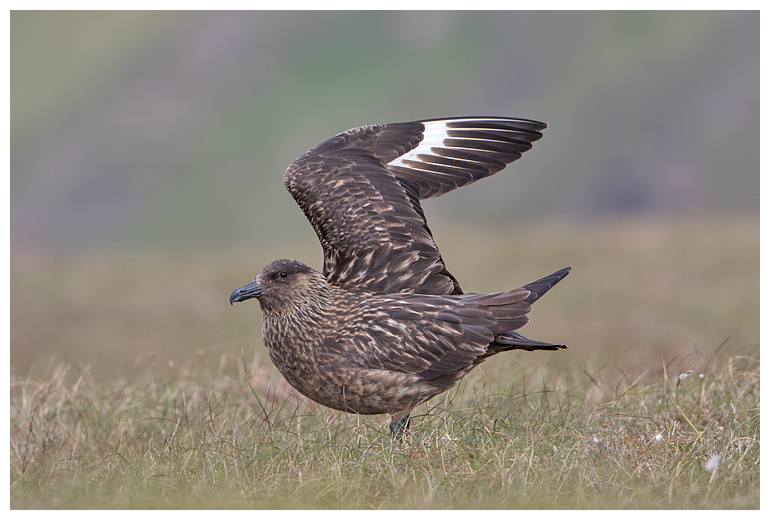 And even better, slightly further along, an Arctic skua perched on a small mound, simply watched us go by, and allowed us to get some frame-filling images. Last time we were on Fetlar, Paula tricked Kate into taking a walk along a track near nesting bonxies, and poor Kate had had to take cover as one of the massive birds dive-bombed her. It was very amusing for us, at Kate's expense. 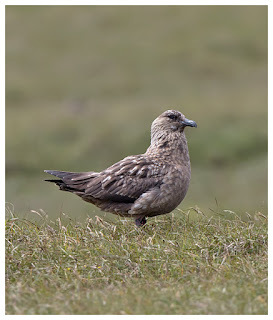 This time we chose to drive along the track, and the bonxies (great skuas) seemed a lot more at ease with that decision, barely even bothering to look at us, let alone move. 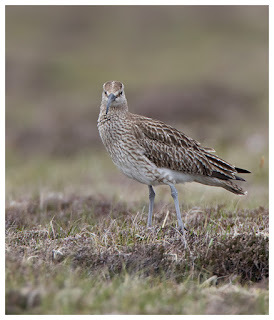 Wanting to try again for some whimbrel shots, we returned to the airstrip area, though this time Kate and I chose to explore on foot, and were soon crawling along low down in the heather, trying to avoid treading on the many vibrant wild flowers dotted around, especially the orchids. By now the sun had started to find a way through the clouds, and this gave us problems. One could be solved by walking right around the area to get the light behind me, but the other, the haze from the warming ground was not so easy to solve. However with no need to worry about the time, or fading light, it was a case of waiting and being persistent. 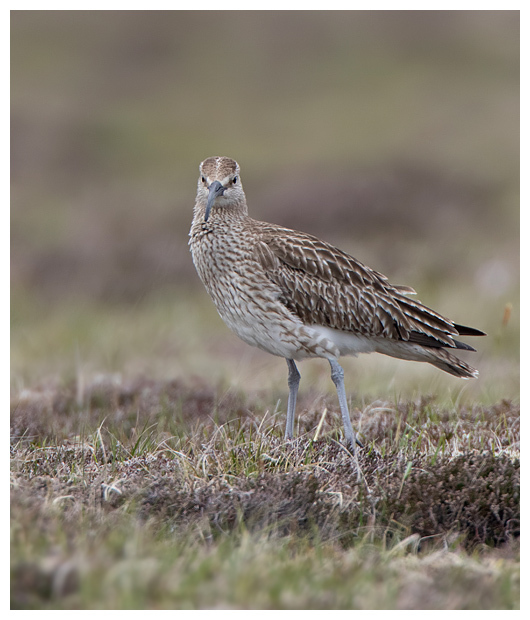 What amused me, was the number of times I tried for a whimbrel shot, then glanced elsewhere to find a golden plover had come over for a look. 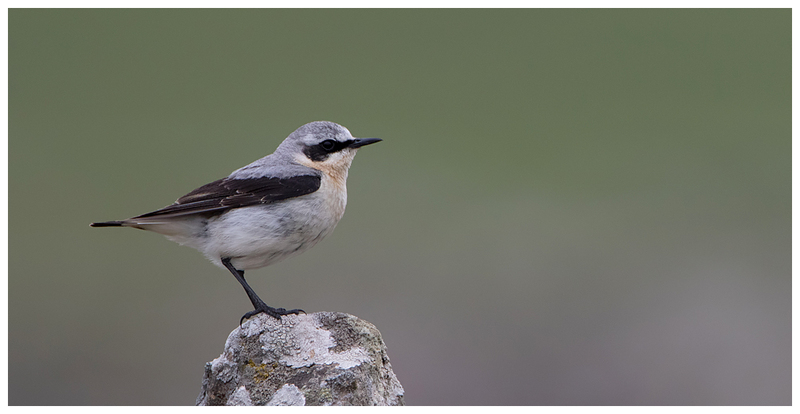 Rejoining Andy and Lyndsey near the loch again, we turned our attention to a family of wheatears being fed around the ancient stone walls. The two adults were busy pouncing on insects, to take back to the fledglings, and each time, would pose on something high, to look for food. This gave us all great opportunities for images on both natural and man-made perches. Lovely birds, and never ones to be overlooked in favour of the more specialist species up in Shetland. 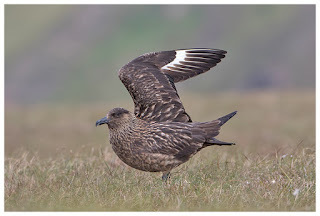 That said, when a pale Arctic skua zipped overhead, I did get distracted for a moment. Fantastic predators. Lyndsey and I then opted to take another look at Loch Funzie in the hope that a diver might have come a bit closer to the shore. On initial inspection we failed to see any close in, so I chose to lie down again at water-level near the road, whilst she tried to get some shots of a gull further along the shore. As she was doing so, I glanced across at her and saw a diver, pretty close in, in front on her. Peeved to say the least, I ignored my temptation to head over towards her, in case I spooked it. I followed it with my camera and managed to get the whole sequence of it taking off. It was only when I spoke to Lyndsey moments later that she admitted to having not even seen the diver until it had taken flight, and she was so annoyed with herself. These things happen in wildlife photography! I stayed put near the loch, and hoped one of the other divers might come close. It did, eventually, but by then the clouds had returned, and I just couldn't get that rich redness of the neck to be captured that well on the shot. With two ferries and a long drive ahead of us, we had to bid farewell to Fetlar, and head back home. But what a day we'd enjoyed on the island. Phabulous!